Welcome Lobo families to the 2018-2019 school year! The PTSA is YOUR Parent, Teacher, Student Association! Quimby Oak Teacher & Staff Wishlist - Donate items to your child's classroom! It’s the start of another great school year and what better way to support your wonderful teachers and staff than by fulfilling their wishlist! Our teachers and staff go above and beyond to make the classroom an environment for our kids to thrive and excel in. We should all do our part by helping to make each classroom and middle school experience even better by fulfilling their wishlist! Please click on the link below to see a each teacher ans staff's wishlist. Items vary from small supplies to project equipment, and no donation is too small! Please send in your donated item(s) with your child and ask them to drop off items directly to the teacher's classroom. If you have any questions, please contact Sanobar Mehta at sanobar@gmail.com. Thank you in advance for your continued support of our school! FUTURE SILVER CREEK HIGH SCHOOL PARENTS! We are currently identifying our 2019-2020 board members and seeking a parent to take the role of Treasurer. The person who takes this position will be responsible for working with the PTSA President and board in establishing and tracking our execution to budget. This person will be required to attend monthly PTSA meetings which are held in the evening, as well as prepare and present the Treasurer’s report at each meeting. If you are interested in learning more about this position or about other ways you can get Involved in making an impact on the future of SCHS, please contact paripham@gmail.com. Reflections is a National Arts recognition and achievement program. 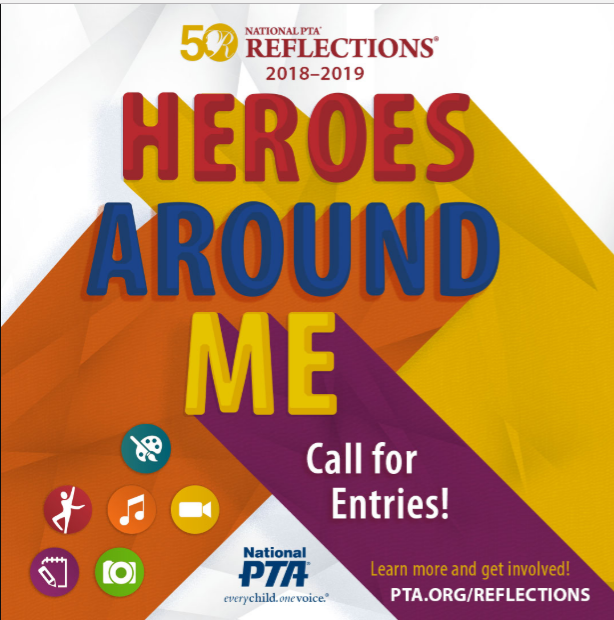 The Theme for this year is:"Heroes Around Me"
Win Awards and Prizes! Be considered for local, regional, state and national level awards and prizes. Learn more about state-level and national-level awards and events. DEADLINE to submit the entries is Thursday, October 25th, 2018. Students must drop off their entries with completed entry forms to the Front Office at Quimby Oak Middle School. Student packets with entry forms are available at the front office for all students. Rules for each category (a MUST read for all parents and students) are in the student packets. Support your school when you shop at Amazon! Shop for everyone on your gift list this holiday by using this link to shop on Amazon https://smile.amazon.com/ch/77-0565247 and Amazon will donate to our school! September 12th - Back to School Night! As the PTSA President, I would like to welcome you to the new school year! The PTSA (Parent Teacher Student Association) exists to help staff support our students not only in the classroom, but also within our school community. Middle school is brief and brings along many new experiences. It’s a time of transition for both students and their families. This is a time when students become more independent, but what does that mean for the parents? It means we still stay active in their lives - we just approach it differently. 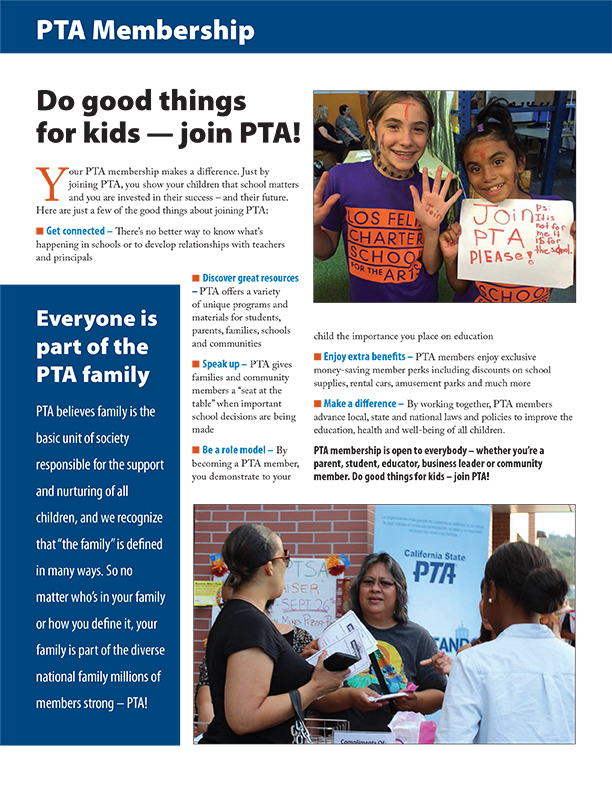 PTSA helps you remain active in your child’s school by providing opportunities for you to become a PTSA member, attend our family socials, support our fundraisers, volunteer at PTSA events & functions, and celebrating our staff members. This year we are adding student representatives to our board. The students will have a voice in our events and activities. PTSA will also be introducing “Family Socials” where families are invited to not only learn about the PTSA, but also become informed & educated about our school, relevant topics e.g. students & technology, college planning, etc. ), and an opportunity to meet other parents at our school. Stay tuned for more information! Calling all ZOMBIES! 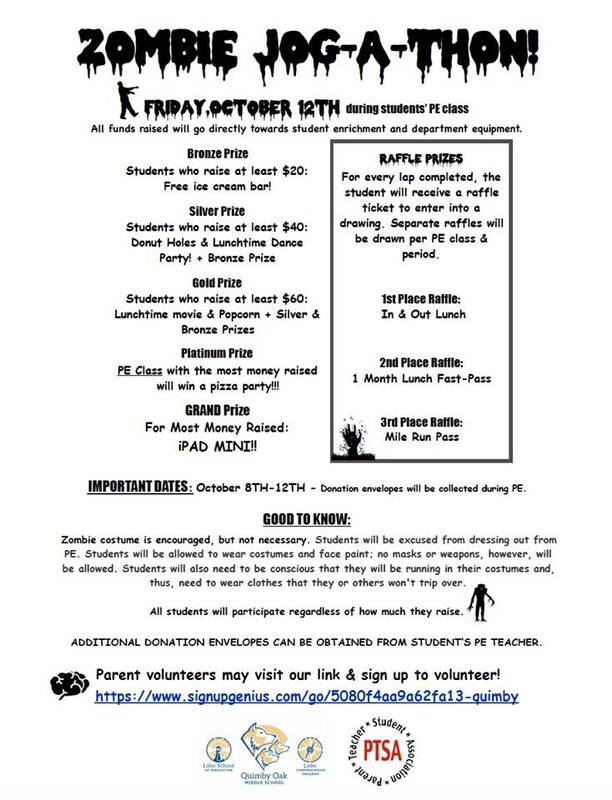 The PTSA is organizing an amazing jog-a-thon event on Friday, October 12th. Zombie costumes (school appropriate) are allowed and encouraged but, not necessary to participate! This is a whole school event taking place during PE. Students, you'll hear all about it Tuesday during your PE class! Parents, the volunteer link is below -- we'd love for you to join us! After visiting with your child's teachers, join the Lobo families in the Quad and learn about PTSA, order Lobo clothing, and eat some dinner while meeting other families. This will be a great opportunity to meet & mingle with other families! We would like to thank our Beautification Gold Sponsor: Freeman Orthodontics! Thank you for supporting our school on our first ever Beautification Day! Quimby Oak Staff Appreciation Lunch! Teacher appreciation week is almost here & the PTSA is looking forward to hosting a lunch for our awesome staff! 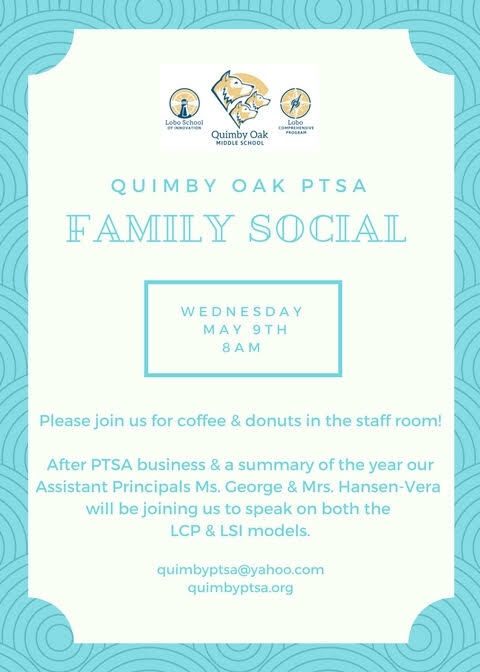 Please join us as we show our appreciation to our staff by donating through PayPal or check (made payable to the Quimby PTSA) towards the lunch or by signing up for one of the side items. www.signupgenius.com/go/5080f4aa9a62fa13-teacher Thank you for your support! 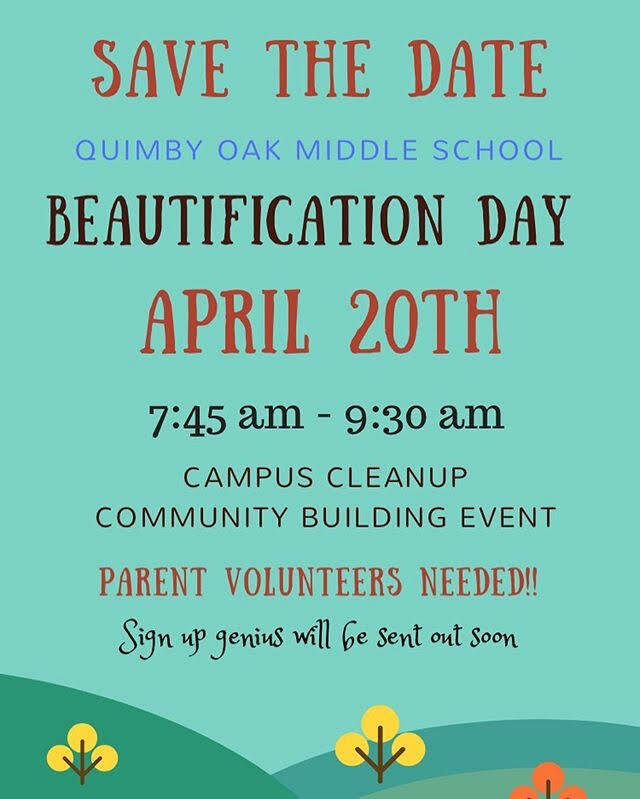 We are hosting our first ever Quimby Oak Beautification Day on April 20th, from 7:45am to 9:30am. We need parent volunteers to help setup and lead the kids in a campus wide cleanup effort. The campus has been zoned, and each teacher team has been assigned one zone for cleanup. You can sign up for your child's teacher team. Volunteers will be expected to be on campus on the day of the event and signup at the Volunteer table. We will hold a volunteer walk through a day prior to the event, that we recommend you attend. We also need some brooms, rakes, big and small shovels for the event. If you are able to bring any of these, please put that in a comment when you sign up. Thank you and let's build some LOBO pride! Save the Date! 10/27 is Quimby Oak's Jog-a-Thon! Can't volunteer but still want to cheer your child on? Then come be part of our cheering squad! Show up to cheer your child on during their PE hour & go to the "cheering squad" area! No need to sign up for the cheering squad - just show up! See you there!!! Staff Appreciation Dinner - donate today! Thank you to everyone who has already signed up and to those who will!!! !